Digifieds is a digital public notice board that allows classified ads to be created, posted, and retrieved from public displays. 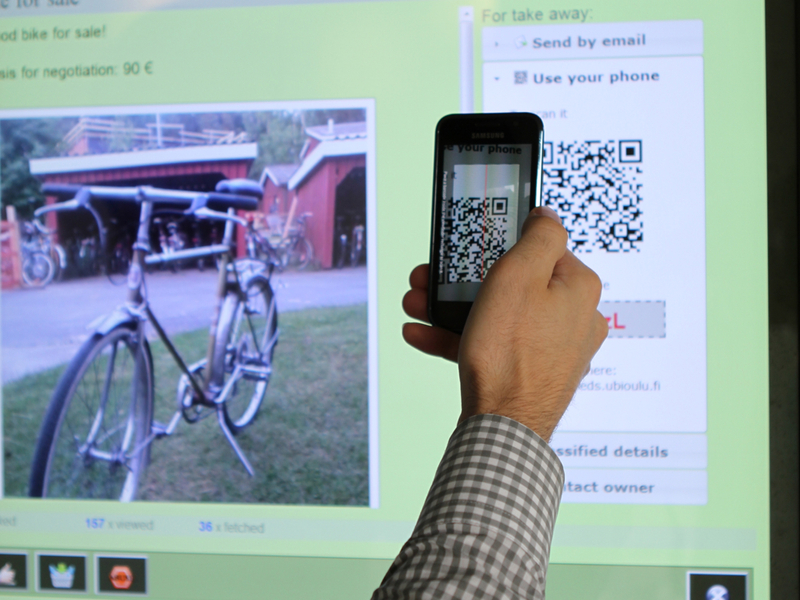 Besides directly creating and retrieving content at the display, Digifieds provides a mobile application that supports different ways of exchanging content with the display (phone-display touch/QR codes/alphanumeric codes). 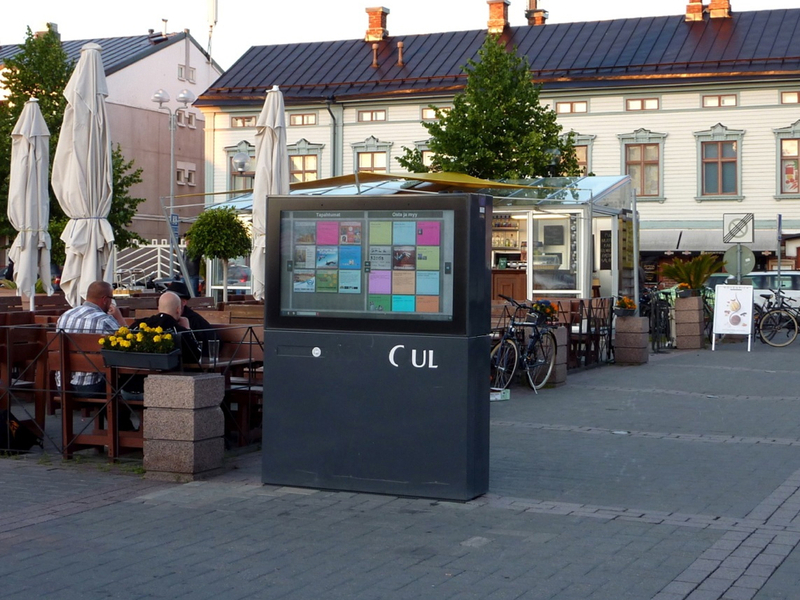 Inspiration for the Digifieds system came from our ethnographic pre-study on practices surrounding more traditional/analog public displays such as shop windows, wall hangers and notice boards. The pre-study showed the importance of traditional notice boards for the local community exchange. Digifieds was deployed on the UBI-Hotspots infrastructure between July and August 2011. 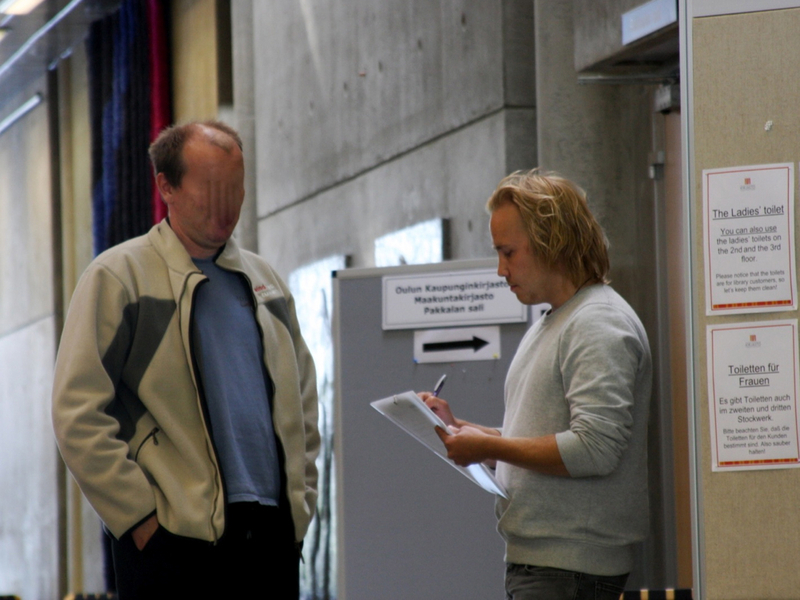 During this time, we performed a variety of evaluations, including observations, interviews, and a field trial. 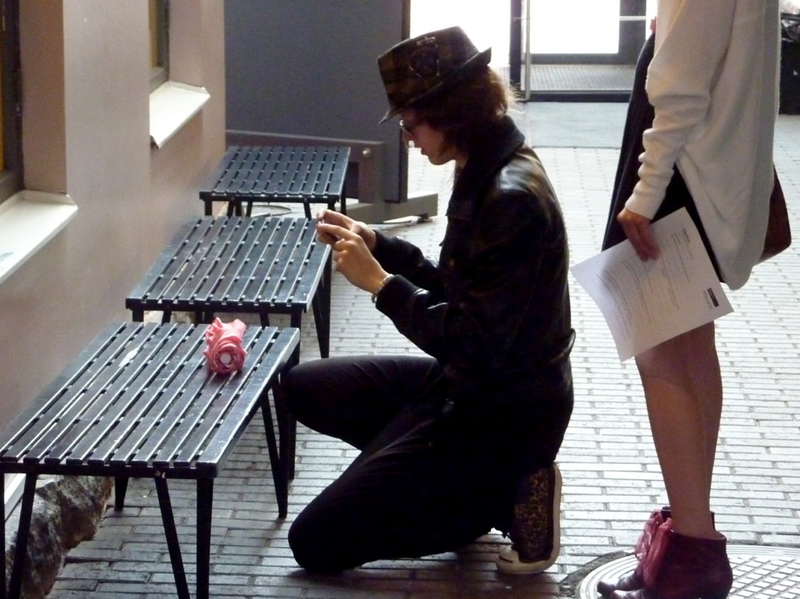 The observation and interviews were conducted on the 11th and 14th of July 2011. The field trial ran over two weeks from 1st until 12th of August 2011. 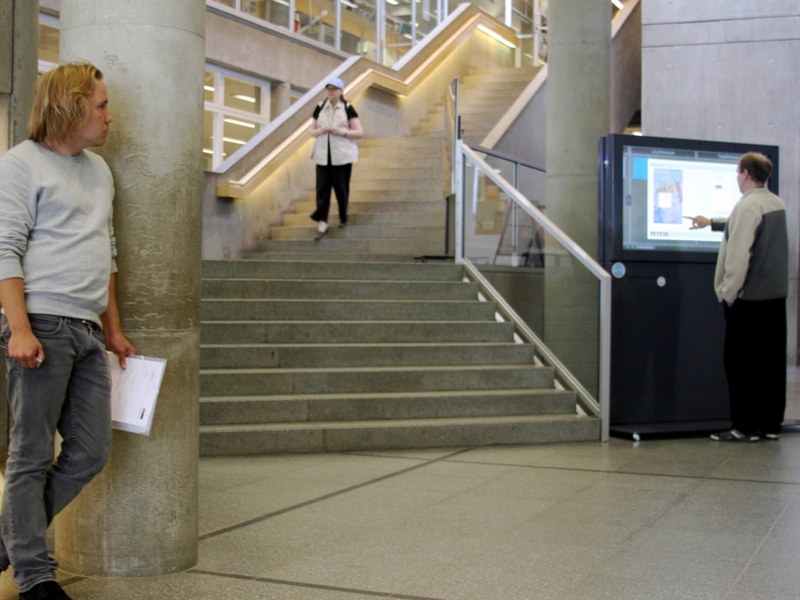 F. Alt, T. Kubitza, D. Bial, F. Zaidan, M. Ortel, B. Zurmaar, T. Lewen, A. S. Shirazi, and A. Schmidt, “Digifieds: Insights into Deploying Digital Public Notice Areas in the Wild,” in Proceedings of the 10th international conference on mobile and ubiquitous multimedia, New York, NY, USA, 2011, pp. 165-174. F. Alt, A. S. Shirazi, T. Kubitza, and A. Schmidt, “Interaction techniques for creating and exchanging content with public displays,” in Proceedings of the sigchi conference on human factors in computing systems, New York, NY, USA, 2013, pp. 1709-1718. 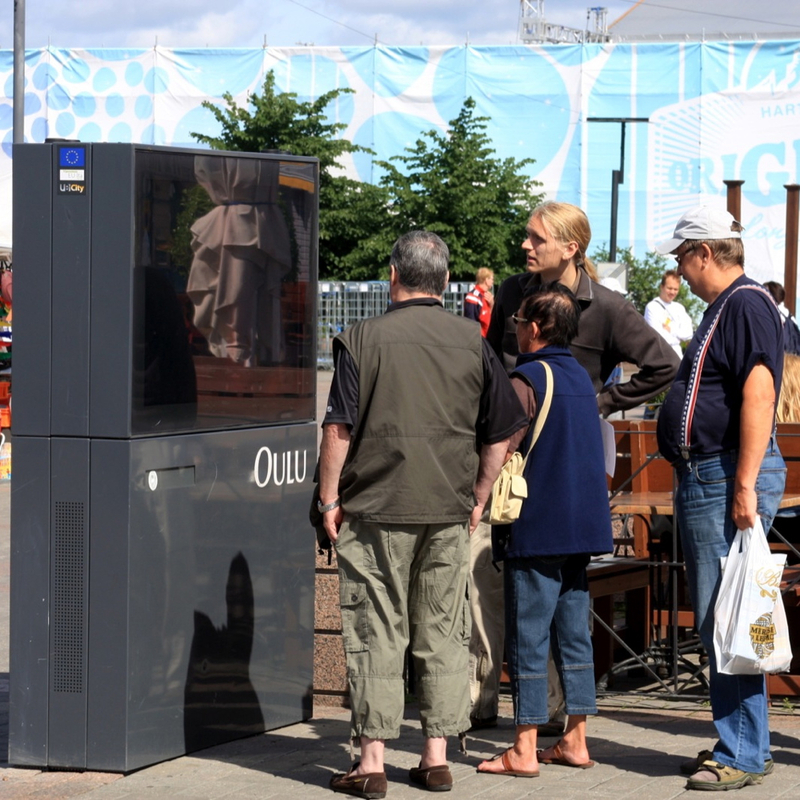 Digifieds was deployed on the same hardware as FunSquare as described in sections 1.3 and 3.1. 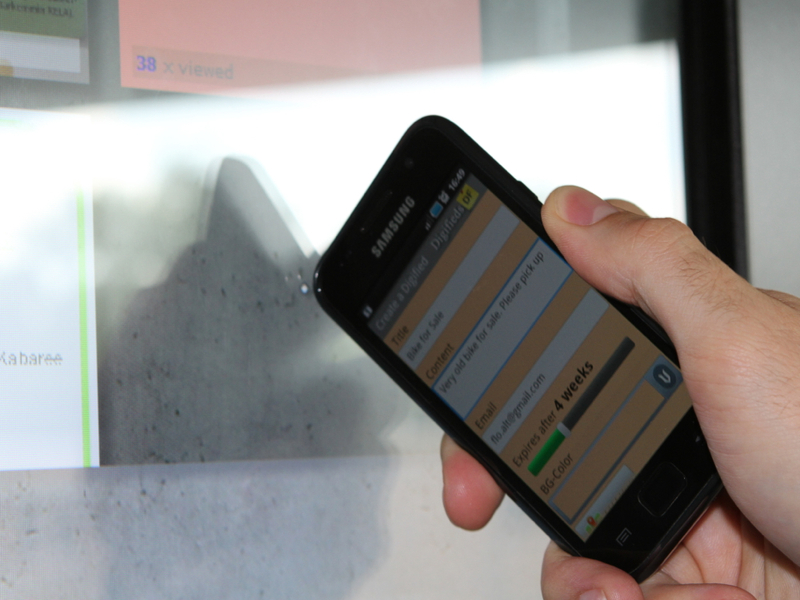 The original version of the Digifieds application includes the previously mentioned phone-display touch feature. 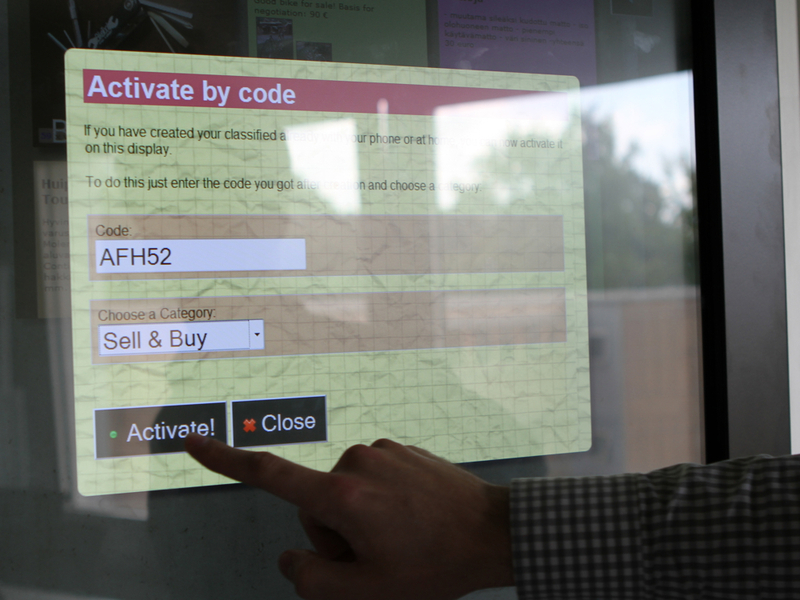 This feature allows content to be exchanged with the display by hitting the desired location on the screen. 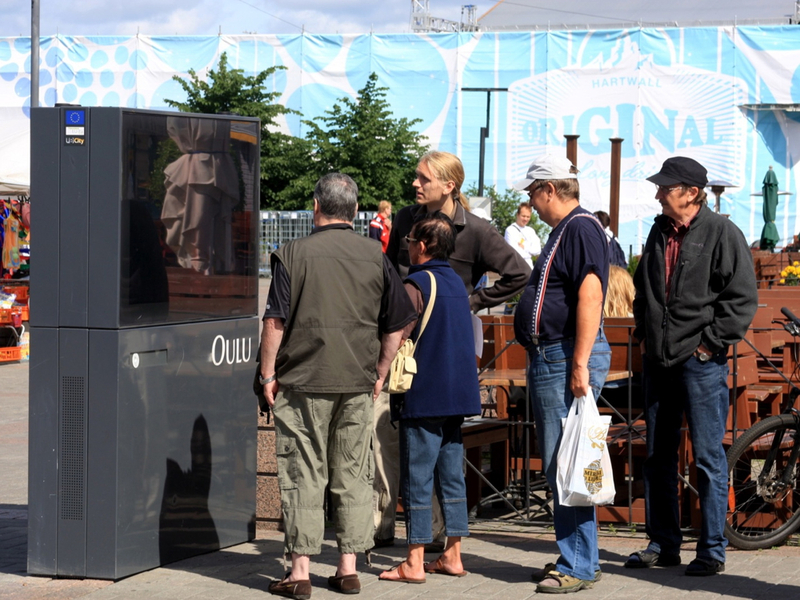 Unfortunately, plans to explore this technique in the wild had to be dropped because the display hardware in Oulu used capacitive touch screens, which made it impossible to detect touches from a mobile phone. Furthermore, we discovered that Nokia is still quite popular in Finland, which excluded users that did not own an Android smart phone. This led to less use of the mobile client than we had expected, as people mostly owned phones running Symbian, and more recently Windows Mobile. The Digified’s system architecture consists of a client-server infrastructure that allows an arbitrary number of display and mobile clients to be connected (see Figure 8). The Digifieds server as the central component of the system is responsible for data management and storage. 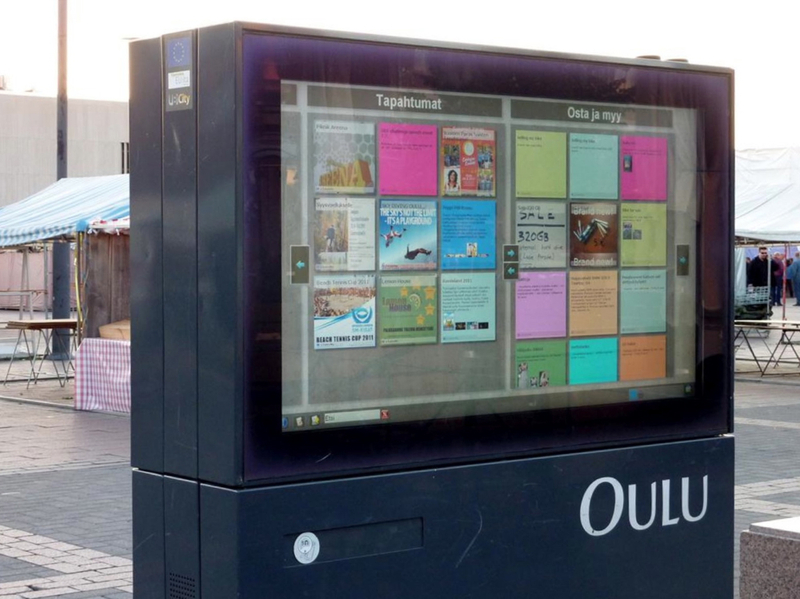 As data and configurations are stored centrally, the exchange of content between clients as well as the replication (e.g., same content on multiple displays in the same neighborhood) is easily feasible. Access to the different clients is provided through a RESTful API. The core component of the system is the Digifieds server, which stores and maintains the content. It requires the open source Glassfish application server, sufficient storage, and requires a permanent connection to the Internet. In addition, different devices can be used as clients, including displays, phones, or laptops. 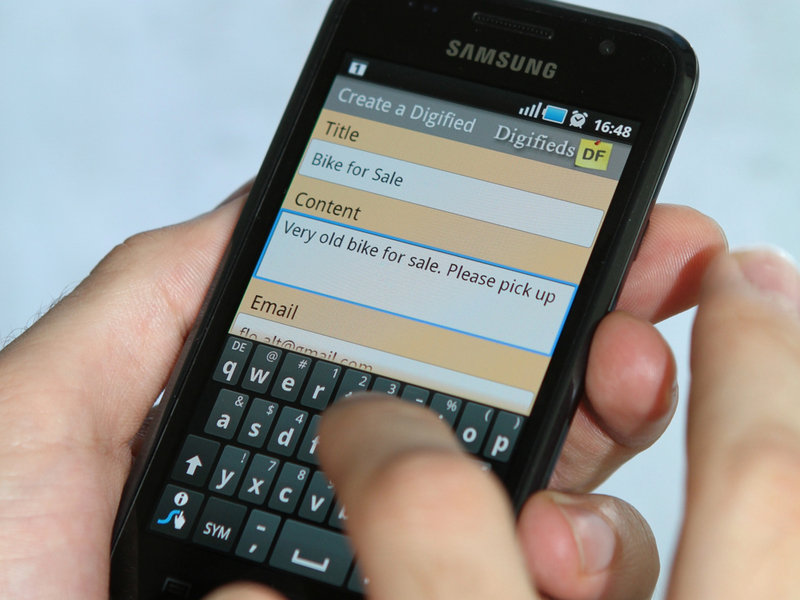 The Digifieds display client – a web application that renders the content and provides means to add and retrieve arbitrary classifieds – can be accessed through any browser simply by calling a specific URL. 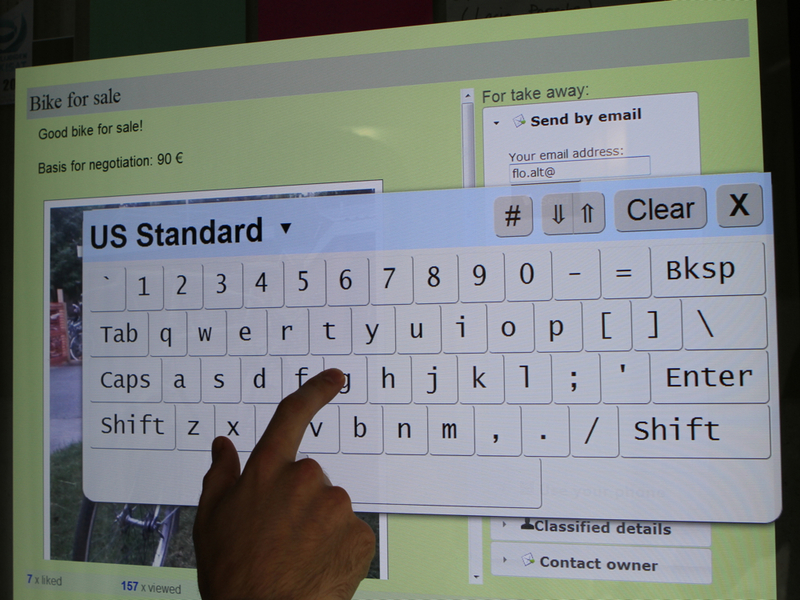 To allow classified ads to be directly created at the display, a touch-enabled surface is required so that the users can enter information via an onscreen keyboard. As an alternative, content can be accessed also from any personal computer through the Digifieds web site where the alphanumeric code associated with each classified ad can be entered. 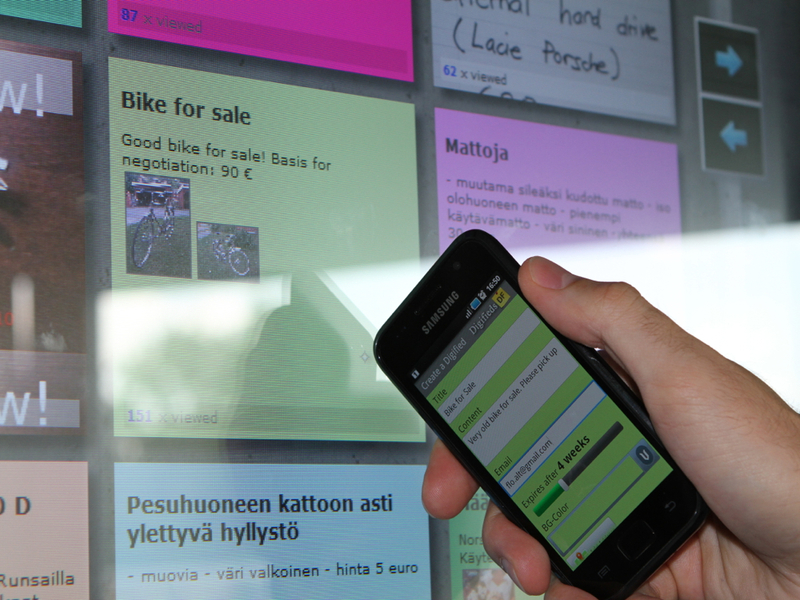 To support easy content transfer to and from a public display as well as to create content on-the-go, the system provides the Digifieds mobile client – an Android app that is available from Google Play or a URL shown on the display. An Android phone is required for installing the client. Optionally, the camera of the mobile phone can be used to embed photos and videos into the post as well as to exchange content with the display via QR codes (retrieving content is either using a native QR code reader or the QR code reader integrated with the application). Digifieds has been designed to support all types of content that are commonly being found on public notice areas, including but not being limited to job offers, announcements of events, sales offers or housing. Whereas posts on digital public notice areas are usually not categorized but rather randomly distributed across the display (offers for babysitting are found next to event flyers and items that are for sale) we decided to support the user by allowing each classified to be associated with a certain category in order to enhance search and retrieval. The moderator of the display or the group of displays (see section 4.4 System Interaction) configures the categories supported by a display in the Digifieds network. The digified itself can, in its most basic form, consist of text only, but advertisers can enhance their posts with photos or even videos. During the 2-month evaluation period, 49 digifieds were posted in the eight provided categories. “Sales” was the most popular (23 items), followed by “Jobs” (10), and “Events” (8).. These posting preferences are similar to the ones from our previous study on traditional PNAs [Alt et al. 2011a]. Housing was not as popular on Digifieds (3% of all items) as it was on the traditional PNAs (15% of all items), which might have been a result of the fact that the evaluation was conducted in the main holiday period. 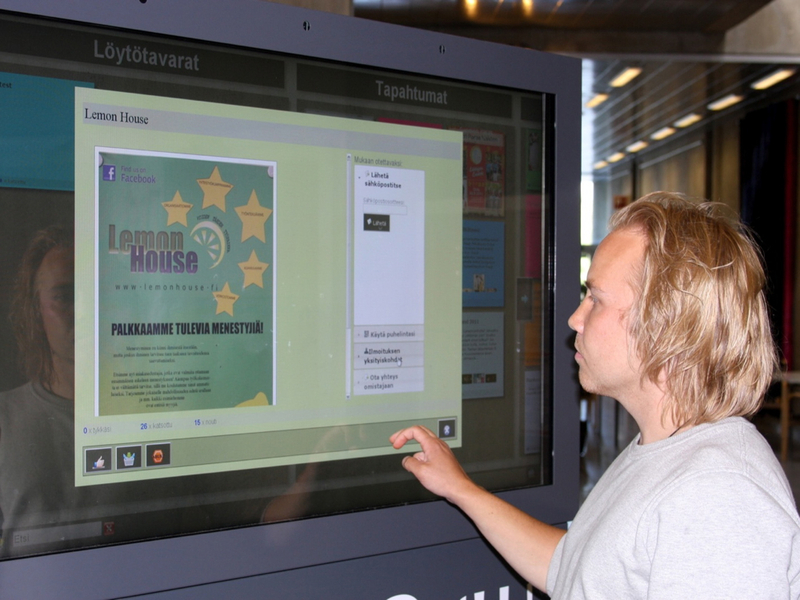 As Oulu is a student city, interest for housing may grow as soon as the new term starts. Similar to content posting preferences, “Sales” and “Events” were the most viewed categories. Summarizing the findings, it can be seen that the envisioned content as well as the actually posted content correlates both for traditional as well as for digital PNAs. 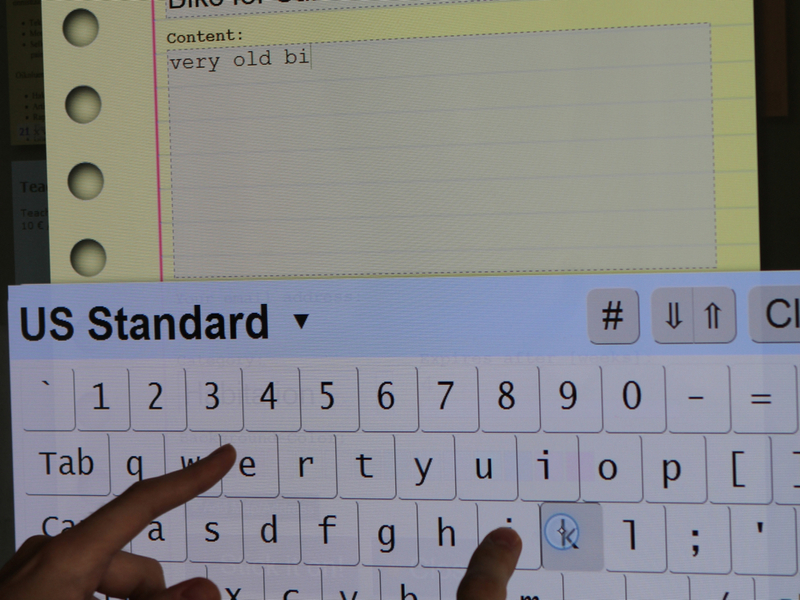 Whereas creating content directly at the display only requires simple touch interaction using the on-screen keyboard, we needed to employ more complex interaction techniques for exchanging content between the display client and the mobile client (see Figure 10). 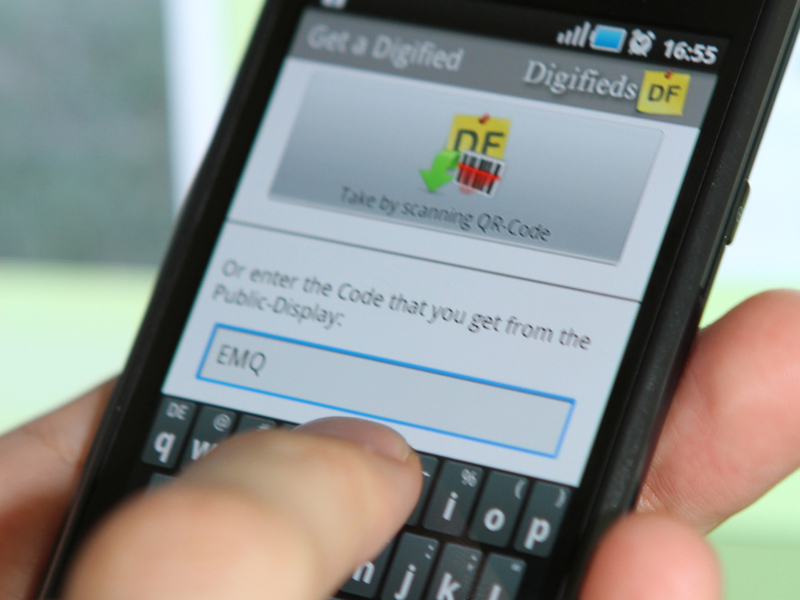 Users can exchange digifieds between display and phone through the phone-display touch technique (described in section 4.1 Hardware), by using an alphanumeric code (see Figure 10-c), or by scanning the QR code of the associated digified (see Figure 10-b). 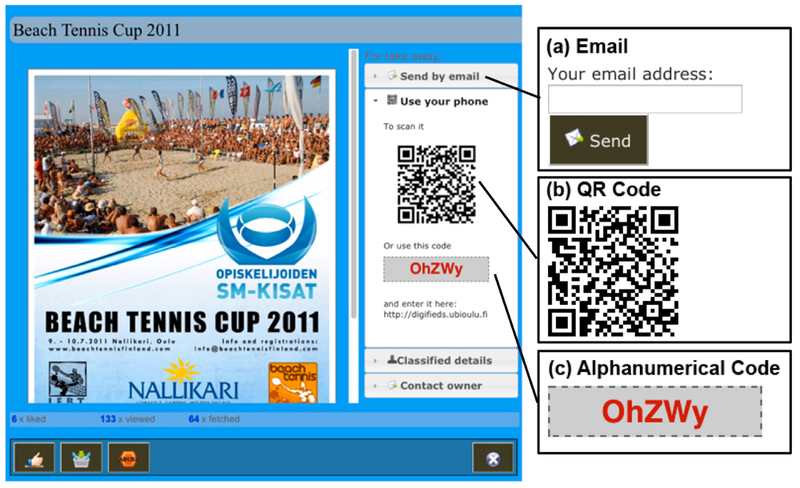 In addition, we enable content to be retrieved via email with the address entered via a form (see Figure 10-a). The user is then sent the content and the URL of the digified. For retrieving multiple digifieds, we implemented a “shopping basket” functionality for the display client. By using this, users could collect all interesting classifieds before transferring the entire collection to their phone or sending it to their email address. We also enabled a search functionality to look for keywords. For simplicity, the search functionality masks out all digifieds that do not contain the required keyword. The ethnographic study of traditional PNAs revealed that locality played a major role. Most of the content was targeted to local communities (e.g., advertisements for a concert in a certain area of town, course books for other students, etc.). In addition we found many examples, where this information was distributed manually over multiple displays that were co-located (e.g., in the same neighborhood / building / etc.). In order to preserve this local character, we designed a concept called display groups. Each group consists of a number of displays with certain properties, as depicted in Figure 11. 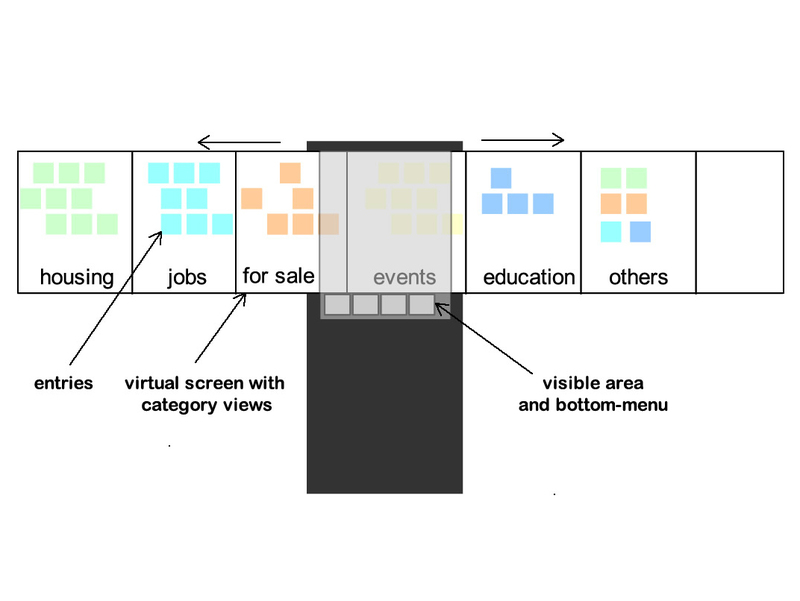 In this example displays are grouped based on location, e.g., all displays at the market square (Area A), all displays in the pedestrian area (Area B), and all displays at the sports center (Area C). However, this concept is not limited to location. The owners of a display can define their own groups and assign the displays. In this way, displays can be grouped based on the needs of the community (e.g., all displays that are in the vicinity of skater parks, etc.). F. Alt, “Digitale schwarze bretter,” in Media cultures, 2012, pp. 317-321. F. Alt, “Digital black boards,” in Media cultures, 2012, pp. 117-120. F. Alt, D. Bial, T. Kubitza, A. S. Shirazi, M. Ortel, B. Ã. ÃÂ¶Ã¢ÂÂÃÂÃ¢Â. Ã¢ÂÂÃ. ÃÂ¶Ã¢ÂÂÃ. ÃÂÃ¢ÂÂÃÂÃÂ¶Ã¢ÂÂÃÂÃ¢ÂÂÃ¢ÂÂÃ¢ÂÂÃ. ÃÂ¶Ã¢ÂÂÃÂÃ¢Â. Ã¢ÂÂÃ. Zurmaar, F. Zaidan, T. Lewen, and A. Schmidt, “Digifieds: Evaluating Suitable Interaction Techniques for Shared Public Notice Areas,” in Adjunct proceedings of the ninth international conference on pervasive computing, San Francisco, CA, USA, 2011. S. Schneegaß, F. Alt, and A. Schmidt, “Mobile interaction with ads on public display networks,” in Proceedings of the 10th international conference on mobile systems, applications, and services, 2012, pp. 479-480.